CA redwoods also hold each other up with their massive shallow root system. They also communicate with these system. Thanks for your efforts to save our forests. I think there are many of us who have “known” this fact for years but appreciate the science to prove it. Yes! Sometimes we do just “know” these things but it is still very important to have proof as well to back it up. Excellent. I fully appreciate this and believe it to be true. In the same way that plants respond to music, being touching and been spoken to. Mozel Tov. Why taking individual trees out of a forest, aka selective logging and practised here in New Zealand’s privately owned native forests,lauded as sustainable forestry,is anything but, based as it is on appalling ignorance about what makes a forest work as an ecosystem. Oh my! We lost a wonderful old maple tree several years ago. It had been around a large patch of pine trees from an overgrown Christmas tree farm. We were advised to remove the pines as they seemed to by dying and presented a fire hazard. The lovely Maple gradually died after the pines were removed. I loved that tree. am guessing one could seek forgiveness and blessing of that space, you did what you believed was a “good” thing. Now with knowledge amend with your emotions, maybe? Go pray there with what you know. THANK you susan for sharing and considering these words. I’m an arborist. I don’t want to take the lives of trees. They’re intelligent and have a spirit. Plants are so much more than what we think. Same with fungi, check paul Stamets, he believes their conscious. It’s all changed my life. I bet it missed its pine buddies. I hope trees can tell if humans are lying to them, or I hope we can’t learn to “talk” to them. They will be here even if humans go extinct…Trees are magnificent! I don’t like putting bad stuff on them to experiment. Didn’t that feel bad? So fascinating. I’ve always loved trees! But someone enlighten me: the trees also communicate with each other by emitting radiation from their leaves? A Geiger counter is used to detect radiation, and Ms. Simard was using a Geiger counter to listen to the tree leaves. Does this make sense to anyone? I was just used as a marker , so she could track it . Like when Dr. puts a contrast dye into your body then traces it through Kidneys or brain . But in this case it showed the path from one tree to another . She had to do this to prove her point. No she didn’t have to do it, and neither do most of the doctors who use it. I have never yet heard a doctor who does give the patient the right to informed consent. If questioned, they lie about safety. The H. pylori test even has two versions, with one without radiation, but won’t warn patients. Makes me wonder if it’s clever way to give rid of some nuclear waste like how fluoride put in our water against our will is the industrial waste version. No amount of radiation is safe. Humans are so quick to use it medically, which greatly increases the cancer rate and heart damage, but it’s rarely question. It’s wonderful to find out this information, but not acceptable to use radiation in any form. Where is it mined, stored, etc? And what about the plants and animals exposed to it? The H-Pylori test is a blood test. You are not exposed to radiation. She used radiated carbon so that she could use the Geiger counter to measure if they were sharing carbon. The radiation was only used for the experiments. She probably used a radioactive carbon isotope, which was not clearly mentioned in the article. 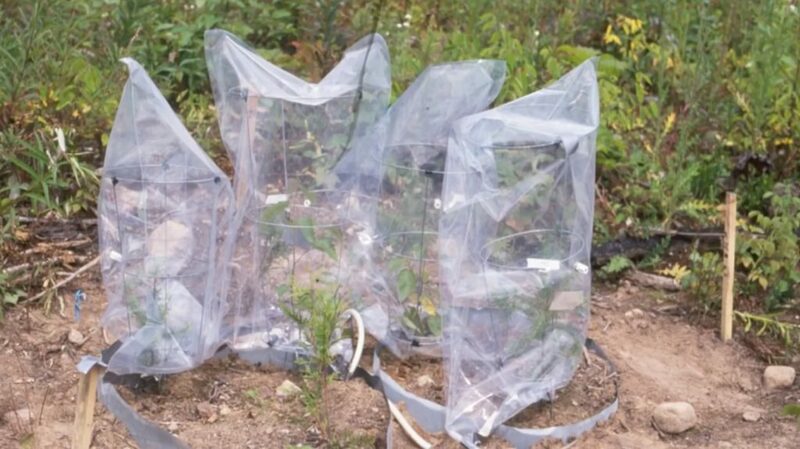 Only that she covered seedlings with plastic bags filled with different types of carbondioxide. That way she could figure out how carbon was transferred from one plant to another. I heard this story on the TED Radio Hour. The radiation reading was because the carbon gas she used has radiation. She chose the gas specifically for the radiation so that she would have something to test for and measure in the experiment. If I remember, both types of trees were covered (possibly to help contain the gas in adequate concentrations, I assumed) but only one type got given the gas. An hour later, the other type of tree also had the radiation reading of having received that particular carbon. Not through the air, and/or through the plastic bag barrier. Just through the root systems. Peter Wohlleben explains this concept in his book “The Hidden Life of Trees”. Yes, wonderful book, still reading it. Indians knew this since ages. Trees not only help other trees but help humans to cure illnesses, remove sorrow and tensions. When really sad just embrace the trunk of old tree and cry your heart out and just experience the relief. I love trees and rocks. I just had to have a dead hickory tree cut down and at the same time 2 small dying dogwoods. I hope my 50 year old huge dogwood does not die now as there are no more close to it. Wonderful insightful talk. Makes me think about the forests along the river and everywhere that are decimated through harvesting. Yes, I had this feeling. I saw the trees as mother earth’s messaging system. Like our hair (they now know it is responsible for our intuition). She will not survive when we have grown like a canker sore, destroying everything that is natural and nurturing us. When the mother earth dies – we shall die. Ho’oponopono because of your comment and would like to bring this into my life. I didn’t know I felt anything for trees until my neighbour took a chainsaw and leveled about sixty 80 year old pear trees that stood in 2 rows. They were ‘used’ as a barrier from the road for other newer tender fruit trees behind them, remnants of a prior orchard I imagine. The trees stood as sentinels, holding hands, all the branches carefully overlapping from one tree to the next so they were always in communication that way, always touching. Now we know they shared roots and took care of each other. It was horror, and a slow weight came into my chest until I cried with unaccountable sadness. I hustled over there and asked why they were being (killed) taken down. The farmer had decided they were ‘old and ugly’, and was planting new trees, Japanese maples. I still ache thinking about those trees and feel in my bones they were friends, family, and knew they were being slaughtered. The fact that there’s a network system is fascinating. But calculators and power regulation systems have information networks…no one couches their information transfers in terms of sentient interaction like this person is doing. I’m afraid they’ll keep animalizing the way they talk about plants (as in calling them “social creatures”) to the point that vegetarians will have absolutely NOTHING to eat. Perhaps it could be more about respecting and appreciating the life one takes to nourish oneself? Living in a way that gives back in addition to taking – and only taking what one needs. Ha! But on a biochemical level, the chemical signals between cells in a mycelium network is not too different from those between neurons in an animal brain. Doesn’t mean they’re interactions are conscious, sure, but might suggest that consciousness is just one solution to the challenge of life. I would say that calculators and power regulation systems network for the sole purpose of achieving a programmed result. There is nothing in it for them. They aren’t capable of reacting to something they weren’t programmed to do. They are inanimate. The individual parts and pieces can’t combine to be something they aren’t programmed to be. They are parts that are only interdependent if they are made to be. Trees are living organisms and have adaptation abilities to achieve the goal of survival. Based on this study, it sometimes means providing the necessary “help” to other living things surrounding it, through some process of information and product sharing, in an attempt to maintain it’s own health. Even today there are those that think that only humans have the ability to override their own natural survival instincts based on feelings, emotions or knowledge. Those people accuse animal lovers of “humanizing” animal behaviors. You suggest that to apply certain “socializing” terms to living plants and/or trees is “animalizing” them. Perhaps we should consider that some qualities apply to all living organisms, because of their survival needs, that do not apply to inanimate objects, and that is what the difference is. Many people are able to communicate with trees and plants. It is by telepathy and the trees are very aware of what people do TO trees or FOR them. I always tried to have great respect for them and kindness to them and spoke to them often. I was moving a fallen branch from a young tree that was bending it down and was told “We call you the friend of the trees”. There have been many other experiences to me and many others. It all comes down to Love. Love is compassion, respect, help to those in need, peace and recognition that we are all one. Anyone or thing will respond to that. Trees and all plants communicate with each other and with us in subtle and vibrational ways. Check out my recordings of shamanically channeled songs in vibrational sound language from the plant spirits titled: Singing Green, Songs From the Plant Spirits at http://www.OmajaMusic.com. A song of trees in the New England forests is song #10, Eastern Tree Canopy Song. The Fungi/mushrooms are what provide the “internet” of the forest. This teaches us that about the worst thing you can do is use fungicide on a tree. it leaches into the ground killing the mycorrhizal fungi. i get mine at Fungi.com (Paul Stamets) the mushroom-god. This is eerily similar to the alien race in Orson Scott Cards “Speaker for the dead”. This is the highest thing I have ever read. Literally, I think Ms. Simard and the person who wrote this are beyond familiar with Tree. Sara… it should not come as any surprise …that trees are also part of our family …and what their care means in terms of our own purpose in being here. I had a tree tell me he loves me…! The event changed my life. Down here in Chile we have this legendary tree called the “Araucaria” or sometimes the “Monkey Puzzle Tree”. The profile of the tree has been adopted as a Chilean national symbol and it is prohibited by law to cut one down anywhere in the country. They produce savory nuts called “pinones” that only the native Mapuche Indians are allowed to harvest. These huge trees are a religious icon to the Mapuche people. They grow to tremendous heights and are NOT hermaphordidic. In other words the individual trees are distinctly male or female and do not carry both reproductive organs as do most other species. When a male and a female Araucaria grow adjacent to one another all of their branches will sequester to one side of the tree and engage each other in what looks for all the world like two human beings hugging in an eternal embrace. It is really quite a spiritual experience to see out in nature an Araucaria pair with their branches engaged in such a loving embrace! It is no wonder that the Araucaria has been so anthropomorphised as to become highly revered in Mapuche and Chilean culture. The ARAUCARIA is a freak holdover from that biologic epoch when dinosaurs ruled the earth. They have survived the tumultuous eons to bless us today with their exquisite beauty and their timeless grace. A little Bush was sobbing to itself in the woods one day. The giant Oak tree standing next to the Bush looked down and asked, “What are you crying about, little Bush?” The Bush looked up and stuttered through his sobs, “I’m crying because I don’t know if I’m the son of a Beech or the son of a Birch!”. The giant Oak smiled happily and confided to the little Bush, “Listen up, Sonny. I knew your mother well and trust me when I tell you that she was the best piece of Ash in the woods!” So you see, trees really do talk to one another and they can be very kind and understanding. Hopefully that’s a link to the Facebook page for’active r.e.m.e.d.y.’ a brave pair of women working hard to reforest the high altitude global forests which have been felled since the 70’s on a massive scale. This has grave implications for water security and the balance of the global ecosystem. Energetic roots of humans also touch the roots of trees and other biotic matter. We’re all connected in one tree of life. That’s why I feel more alive in first growth forests. And that’s why I love practicing tai chi at the base of Redwoods.. .
And, there is some silence to back this up? Saying that it is the trees that are responsible for these interactions is somewhat misleading: the mycelium itself is an assemblage of organisms and species (and also includes bacterial colonies), not all of which are obligate symbionts. 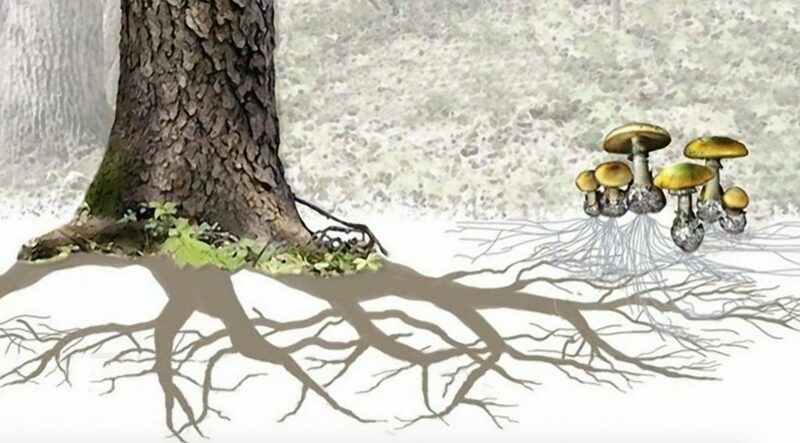 Trees ‘share’ – sometimes its actually just stolen – carbon with mycorrhizal fungi, fungi distribute carbon through the mycelium network and then exchange carbon with trees to promote the survival of local tree/fungi/bacteria assemblages. At the large scale, this can be a powerful driver of population survival (tree clusters up to entire forests). Just as mammal microbiomes help promote the survival of human/microbe assemblages. TLDR: Dirt is alive and there is no such thing as independence. Considering the state of things, carbon transfer may become moot. This is beautiful, thank you. Can you tell me who the artist of the drawings are? NOT like humans. Like humans *ought* to be. Trees are smarter; they act in their own actual interests. We’re the only species I know that actively destroys its own air supply, water supply, food supply, and home, on an ongoing, accelerated basis. Even though a lot of us don’t subscribe to that insanity, we’re complicit as long as we keep allowing the tiny few to destroy these things for themselves and all the rest of us. I don’t know what disallowing them will ultimately look like, but until we do it, we’re complicit in Matricide (i.e., Ayé) and longitudinal suicide. But I love the trees. I hope we can learn to learn from them. Plants have developed surprisingly complex communication networks which allow them to communicate with each other about what’s happening on the surface. 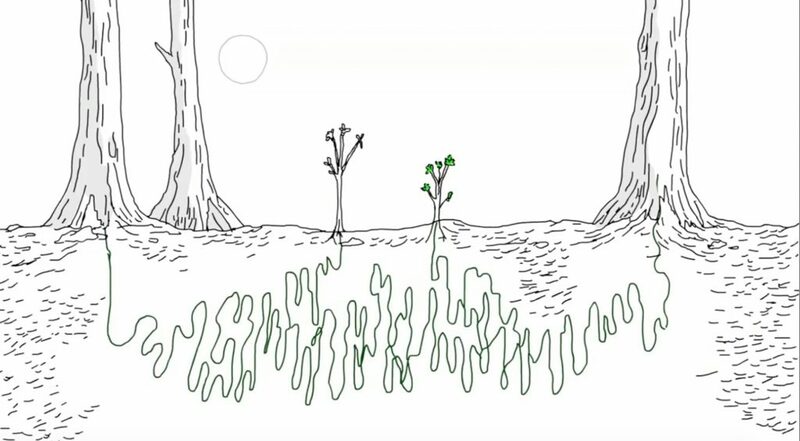 illustration of above ground interactions between neighboring plants by light touch and their effect on below-ground communication. Image credits: Elhakeem et al. Despite their immobile lifestyle, plants are actually more active than you’d think. Aside from all the biochemical reactions that enable them to go about their day-to-day lives, plants can also communicate complex messages underground. Essentially, these messages take the form of chemicals secreted by roots into the soil which are then detected through the roots of nearby plants. These chemical “messages in a bottle” can tell plants whether their neighbors are relatives or strangers and help them direct their growth accordingly. Touch is one of the most common stimuli in higher plants and is well known to induce strong changes over time. Recent studies have demonstrated that brief touching among neighboring plants can be used to detect potential competitors. As plants grow in close proximity to other plants, they constantly monitor any cues that happen above ground — but they do the same below ground as well. To better understand how this happens, as well as to learn more about the ways above ground factors influence what happens below the surface, a team of scientists from the Swedish University of Agricultural Sciences “stressed” corn seedlings and then looked for growth changes in nearby plants. Essentially, they brushed the corn leaves to simulate the touch of a nearby plant leaf and then monitored what chemicals the plant root secreted. The team then took those chemicals and transferred them to other plants to see how they react. They found that plants exposed to the chemicals responded by directing their resources into growing more leaves and fewer roots than control plants. Basically, the team showed that what happens above ground influences what happens beneath the ground surface of a plant — and the way through which they communicate this is more complex than we thought. This makes a lot of sense since the ability of plants to rapidly detect and respond to changes in their surrounding environment is essential for determining their survival. What a load of absolute horse manure! It’s no wonder that this so-called “ecology professor” Suzanne Simard struggled to find grants or that her colleagues thought her insane, if this ridiculous hypothesis is all that she could come up with after observing the plant’s subterranean interconnection. To conclude some form of interconnection and material interdependence between the trees is one thing, but for Simard to then conclude – without a shred of evidence – that the trees are actually “talking” to one another and that so-called “Mother trees” “send their wisdom onto the next generation”, that they “even recognize their kin” and take care of their “babies”, is quite another altogether. This has absolutely nothing to do with Science or its rigors of examination, repeated observation and rational deduction; but instead everything to do with superstitious animism disguised by the emotive language of fashionable Matriarchal Mother-Earth fantasies. It is a work of imagined fiction, pure and simple. The fact that some commentators on this page interpret this as a justification for their own ridiculous claims like “trees are people”, undermines whatever scholarship this so-called “ecology professor” Suzanne Simard lays claim to… and if this is the quality of the “professor”, how ever did she become a “professor” and what must her pupils be like? If anything, this is a sad but clear demonstration of just how far American academia has declined. What a load of absolutely asinine horse manure! It’s no wonder that this so-called “ecology professor” Suzanne Simard struggled to find grants or that her colleagues thought her insane, if this ridiculous hypothesis is all that she could come up with after observing the plant’s subterranean interconnection. To conclude some form of interconnection and material interdependence between the trees is one thing, but for Simard to then conclude – without a shred of evidence – that the trees are actually “talking” to one another and that so-called “Mother trees” “send their wisdom onto the next generation”, that they “even recognize their kin” and take care of their “babies”, is quite another altogether. This has absolutely nothing to do with Science or its rigors of examination, repeated observation and rational deduction; but instead everything to do with superstitious animism disguised by the emotive language of fashionable Matriarchal Mother-Earth fantasies. It is a work of imagined fiction, pure and simple. I feel sorry for you. You sad, angry man. Go hang out in the forest and try and quiet that very logical and patriarchal mind of yours. Science has been dominated by such minds for a very long time. Time to bring it back into balance. I have a marvellous book printed in 1979 which states just this. THE SECRET LIFE OF PLANTS by Peter Tompkins and Christopher Bird. Can I help a fir tree that is being killed by the neighbor’s basement excavation and root removal? Trees also respond if we hug them and “talk” to them everyday. My neighbor’s think I crazy…but I know better! Not impressed with the overt pseudoscience title of this article. have the power of speech. discuss personal or intimate feelings. have formal dealings or discussions; negotiate. and I learned how to UNDERSTANd trees too!!!! I attest personally that we dont know enough yer and need to explore their energetic communicatin as well bacuse I DONT have mycelium and I ve been communicating with trees for years. Why was the cedar not connected in the fungal network?